Review: Since there is nothing coming out of Japan nowadays but manga-adaptations anyway, why not apart from all those romance flicks watch a continuation of probably the best and smartest manga thriller of all time? Its live-action adaptation "Death Note" also managed to convince, even though it didn't reach quite the level of ingenuity as the original work. 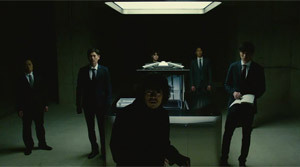 The success was so big, though, that next to the official sequel "Death Note: The Last Name" there was also a spin-off centering around the investigator L in the shape of the picture "L: Change the World" finding its way to the big screen. Latter one wasn't worth remembering and so having doubts about the quality level of a standalone continuation of the story revolving around deathly notebooks was well-founded. But in the end you actually get a quite decent thriller, although the film's flaws are all too apparent. First of all, it will catch your eye that director Shinsuke Sato, who last managed to score with his manga-adaptation "I Am a Hero", unnecessarily attempts topping the previous story by weaven even six Death Notes into the plot. Ultimately, this is only a halfbaked attempt to enhance the story, because there are in fact only three Death Note owners at the same time at best. Also, the hunt doesn't get more thrilling only by adding more Death Notes. Furthermore, the movie lacks the smart cat-and-mouse game of the original. The two rivals can't even in the slightest hold a candle to Kira and L and their train of thoughts as well as multi-layered plans. Yet, there is the attempt to work in as many twists as possible. The end result can naturally only be that quite a few things turn out to be illogical and some individuals act even outright stupid. An alleged hacker is known to soon get in touch with Misa. So what does the special task force do? Right, they monitor Misa via CCTV, but the cameras of course get hacked. And during the most crucial moment the task force doesn't manage to conceal their faces during the attempted seizure of a criminal. And this even though it seemingly is as simple as covering your face with your forearm. But nobody really expected that the story would knock our socks off as the original by Tsugumi Ohba and Takeshi Obata did. Yet, it's almost a crime that the focus has been shifted away from the characters and their battle of wits to running around, which more resembles the typical thriller genre. Thus, the biggest downside of the movie has been addressed now, too. The protagonists don't have any chemistry. At least Ryuzaki and Mishima manage to create something similar to it towards the end, but that's when it's already too late. Of course the bar has been set very high by Kira and L, but here the director seemingly couldn't decide whether he wants to stick to those characters as close as possible or instead get off the ground something entirely different. The end result is a compromise that isn't satisfying. Shien, played by Masaki Suda ("Assassination Classroom"), depicts the villain and there isn't any serious color added to him. Sosuke Ikematsu ("After the Storm") plays his role with a few nice pecularities, but his dialogues with his archrival are simply boring. Only towards the end and in the relationship between Ryuzaki and Mishima something like an attempt becomes visible to shed some more light on the individuals. But since this is otherwise carelessly neglected Mishima almost degenerates into a supporting character, which turns out to be problematic. Instead of intelligent moves in the game the protagonists run after Death Notes and therefore often enough in circles. That's frustrating and most importantly doesn't justify a running time of 135 minutes. However, you have to give "Light Up the New World" credit for actually having its moments. Misa Amane, Erika Toda reprising her role from the original, has a nice dramatic scene and the ending after the actual finale can also be surprising and of course leaves room for a sequel. Concerning the characters' demise the moviemakers also prove to be gutsy. As already stated this only helps to a small degree since the inventiveness of the original isn't given, which also includes rather unimaginative sets. 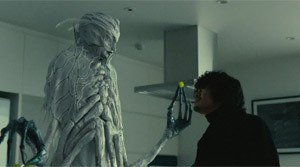 Still, kudos to the creation of the Shinigami, which this time come to life via impressive CGI. It's on a whole different level than what we saw in the original. Sadly, Ryuk looks a lot more shallow character-wise this time. Let's hope that director Shinsuke Sato shows a bit more sensitiveness for interpersonal relationships in his next manga-adaptation "Bleach". "Light Up the New World" is a decent thriller, but it doesn't really do justice to the title "Death Note"; also since the philosophical aspect of the main theme has been dropped.